As Mr. Kopf said, the dream is not as elusive as it might seem. And what is a High Performance Sales Environment®? It is one where the conditions conducive to a successful sales culture have been put in place, which results in predictable, continuous, metric-based performance improvement. There are seven conditions, or building blocks, primarily impacting salespeople, frontline sales managers, and – perhaps most importantly – sales executives. Only about 15 percent of sellers are natural, intuitive “sales eagles.” Most, therefore, need the systematic approach afforded to them by a sales process. That systematic approach should provide them with the ability to execute the 10 skills necessary for success (ranging from prospecting and need development to negotiating and closing), enabling them to better execute their sales calls and better define, manage, and control their sales cycles. The image shows the “big picture” of the Sales Execution Programs from Adventace Methods™. But the Sales Process is only half the battle. Working in tandem with process, Sales Enablement must ensure that the right information is available at the right time and in the appropriate format, whether the sales team is being trained, preparing for calls, or executing critical steps in the sales cycle. The next set of conditions are specific to first line sales managers. They are the linchpins of the sales organization, because they must provide salespeople with the consistent support and coaching necessary to ensure their long-term metric-based performance improvement. Here the sales process functions as a bridge between sellers and their first line sales managers, setting the stage for these next four conditions. 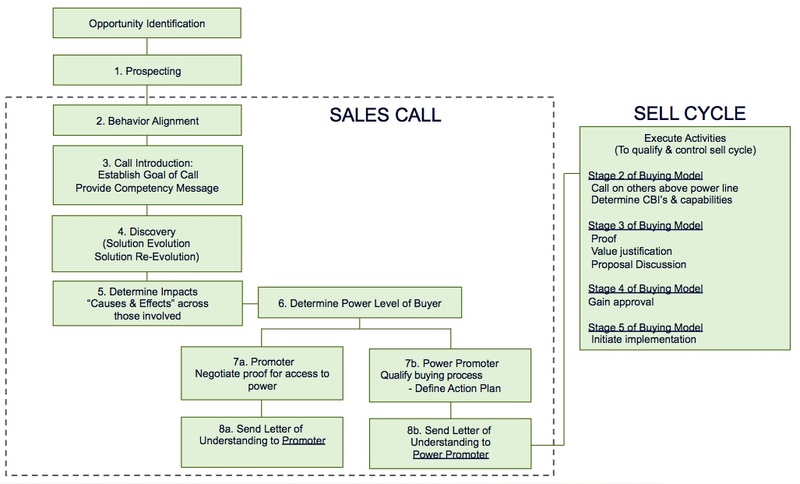 As shown in the figure to the left, collectively these four conditions are called the Sales Operations Review, which must be consistently performed by first line sales managers. For more information you can take a look at High Performance Sales Management™, the Adventace Methods program designed specifically to help first line sales managers. There are six key opportunity qualifiers against which managers should assess opportunities (for more information, see Opportunity Qualifiers). This will allow them to identify gaps and problems early in the life of an opportunity and work with sellers to overcome them. And, if they cannot be overcome, the manager should likely make the “tough love” decision to disqualify the opportunity. A key to achieving predictable objectives is to have a continuously balanced pipeline. By managing sellers to a pipeline balance algorithm, managers not only maximize the potential for sellers to make quota, but do so by making sure that, when a period ends (be it a month, quarter, or year), the seller goes into the next period with a balanced, fully loaded pipeline. Predictive metrics enable sales managers to pinpoint specific seller performance challenges today that will impact their ability to achieve objectives tomorrow. Managers are then able to put in place the necessary proactive actions that address the challenges that might have prevented the seller from achieving their objectives. The combination of opportunity assessment, pipeline balance, and predictive metrics gives a manager a crystal-clear view of a seller’s skill deficiencies. Then, using the sales process, the manager is able to provide the seller with a surgical development plan resulting in long-term metric-based performance improvement. In so doing, the sales manager will unlock a seller’s potential and create a sales eagle! In fact, here’s a great Success Story. Brian Chesky, CEO of Airbnb, said, “Culture is simply a shared way of doing something with passion.” Simply put, the sales executive defines that shared way of doing something, thereby setting the sales culture. If he or she is “hands-off” or inconsistent, then individual managers will set that culture for everyone who reports to them – be it good or bad. This means overall suboptimal performance, and frequently leads to a “wild west” sales culture. So to Create the High Performance Sales Environment®, sales executives must define and drive a successful sales culture from the top-down. And to do this, they must conduct their own higher-level sales operations review with their sales managers. 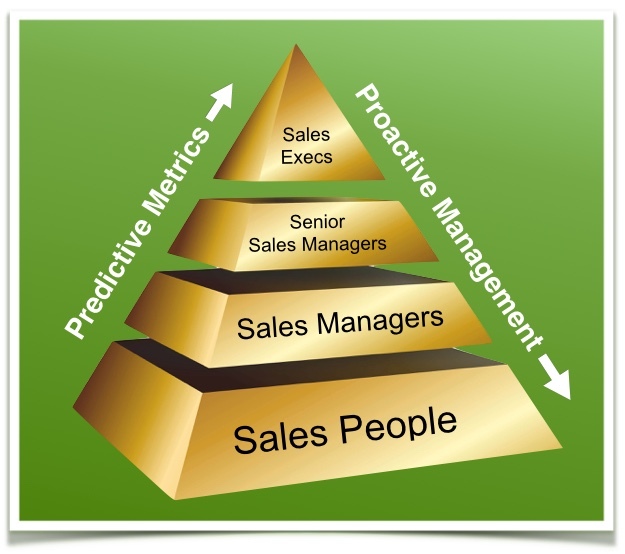 As depicted in the diagram to the right, management to predictive metrics, a key component of the sales operations review, play a key role. This will set the tone and level of expectation for sales managers, who will in turn set that tone and level of expectation for their sales team, thus defining the sales culture throughout the organization. Therefore, of all the conditions, this is the most important – because it makes the others “stick.” Learn more at Executive Management. The CRM should be the “icing on the cake” that automates the first six conditions. It should benefit sellers by helping them win more business. This can be accomplished through easy and rapid generation of custom buyer-facing deliverables (which, for example, summarize buyer needs and agreed-upon steps leading to a buy decision). This, in turn, should help them better define, manage, and control their opportunities. It should also facilitate those key sales management and sales executive conditions by enabling opportunity assessment, pipeline balance, skill development, and the provision of predictive metrics. And we’ve done this! See the Adventace Sales Management System™, our award-winning Salesforce-based application. So the dream of achieving a high-performance sales environment is very doable. Our clients have achieved whopping 647% increases in product sales, 975% improvements in key performance metrics, 575% increases in their pipelines, and 925% increases in average contract values. It is well worth the effort! Contact us if you’d like to discuss your sales operation, how to implement the seven conditions, and the measurable impact they will have. Watch Bob Junke, Adventace’s CEO, in his interview with Selling Power TV’s CEO Gerhard Gschwandtner, where he discusses the seven conditions to create high performance. Researches have identified 4 categories for sales operations. They found that Level 4 operations dramatically outperform Levels 1-3. Want to see where you are?